"Macaban" redirects here. For another Spanish wine grape known as Macaban, see Merseguera. "Lardot" redirects here. For another wine grape known as Lardot, see Chasselas. "Forcalla" redirects here. For the red Spanish wine grape that shares this and other synonyms with Macabeo, see Forcallat tinta. 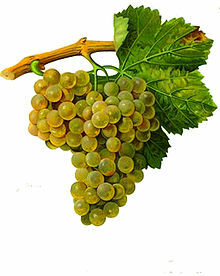 Macabeo, also called Viura or Macabeu (Catalan: [məkəˈβew], French: [makabø]) is a white variety of wine grape. It is widely grown in the Rioja region of northeastern Spain, the Cava producing areas south of Barcelona, and the Languedoc-Roussillon region of France. Spanish plantations stood at near 32,000 hectares (79,000 acres) in 2004, and French plantations at 2,800 hectares (6,900 acres) in 2007. A white Rioja made mostly from the Viura grape. The grape is mostly used to make mildly acidic and young white wines mostly suitable for early consumption or blending with other varieties, both red and white. Some of the most pleasurable examples of the variety are planted along the Pyrenees, where it is used to produce highly saline and textural white wine. Probably the best white wine grape for natural wine making in warmer climates. It is also often the main grape of white Rioja and is sometimes blended in small amounts with Tempranillo and red Garnacha, both in unoaked and oaked versions. 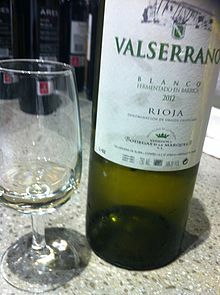 It was introduced in Rioja after the phylloxera epidemic, where it largely replaced Malvasia and Garnacha blanca, partially because of the ability of its wines to better withstand oxidation. Some producers of white Rioja make superior wines (Reserva and Gran Reserva) subjected to extended ageing that can span decades, resulting in a highly distinctive and aromatic wine. Macabeo (or Macabeu as it is known in Catalan) is traditionally blended with Xarel·lo and Parellada to make Cava, the best known sparkling wine of Spain. It is also used in the base spirit used to create Obsello Absinthe. Macabeo is also known under the following synonyms: Alcañol, Alcañón, Blanca de Daroca, Charas blanc, Forcalla, Gredelín, Lardot, Listan Andaludschii, Listan Andaluzskii, Lloza, Macaban, Macabeu, Maccabeo, Maccabeou, Maccabeu, Makkobeo, Malvoisie, Provensal, Queue de Renard, Rossan, Subirat, Tokay, Viuna. Some of these synonyms are also proper names of other grape varieties. ^ a b c Jancis Robinson, ed. (2006). "Macabeo". Oxford Companion to Wine (Third ed.). Oxford: Oxford University Press. p. 414. ISBN 0-19-860990-6. ^ "VIURA". Vitis International Variety Catalogue VIVC. Julius Kühn-Institut - Federal Research Centre for Cultivated Plants (JKI), Institute for Grapevine Breeding - Geilweilerhof (ZR). August 2017. Retrieved 2017-09-28.